Now that days have passed since the presentation of the White Paper by the Dept.for Transport for a high speed strategy we can look at it in a cooler fashion. Greengauge21, a strong pressure group, in favour of high speed rail, and Network Rail, who will probably end up being the owner of the tracks, both have given measured responses which are predictably very positive. With the deluge of information and opinion since the presentation it has proved difficult to extract the wheat from the chaff. However, the proposal has good points and others which are not convincing. Generally speaking there are some interesting solutions to squaring the circle but a lot of questions are left up in the air. With the Dept.for Transport inundating the public with the White Paper, the HSR2 Ltd.´s recommendations, and the consultants´reports there is a tremendous amount of very detailed material to absorb. In a few words let us say what the White Paper is not - it is not a high speed rail strategy. In that sense it is disappointing and the more it is looked at the more you can see there has been no strategic thinking but more of a political proposal to a growing demand. 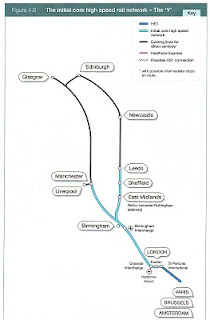 The Paper is a detailed plan to offer a high speed line from Central London to Central Birmingham. This is an achievement in itself and so welcome, but it is flawed. 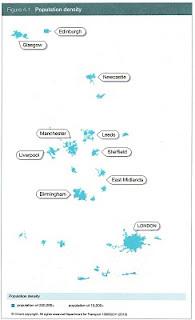 North of Birmingham we only have two lines drawn on a map - one to Manchester and the other to East Midlands, Sheffield and Leeds, both with no detail at all and with very vague promises to continue north to Scotland. In fact it should be noted that it is rather contradictory to say that you cannot have intermediate stops on a high speed line as this would reduce its effectiveness (top speeds well below the capacity) while to Leeds(from Birmingham) two intermediate stops are being offered. This reads like a political sop to local interests. 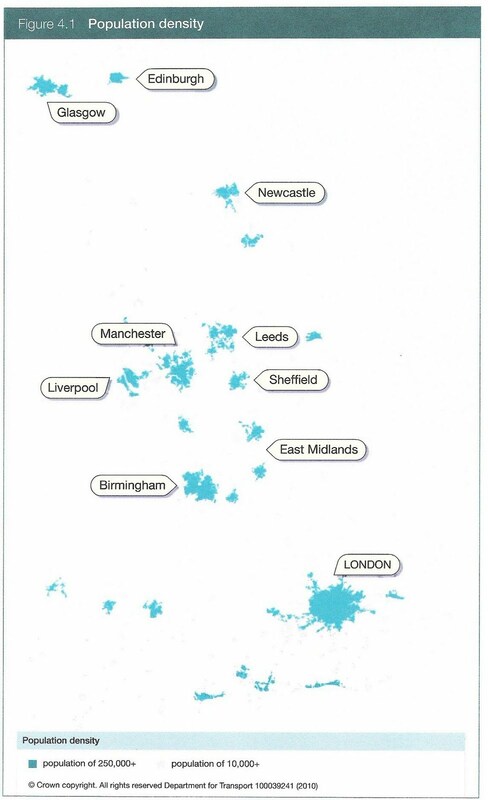 Let us go back to basics and look at the population density map provided by the DfT. which gives us a easy picture to understand the problems. 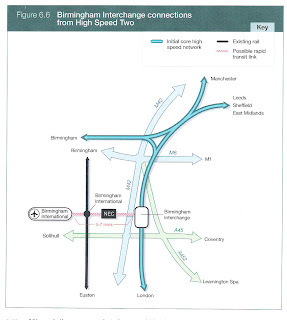 All these plans can be seen in greater detail in the command paper (White Paper) published by the DfT 11th March 2010 dealing with HSR2. We publish them courtesy of the DfT. 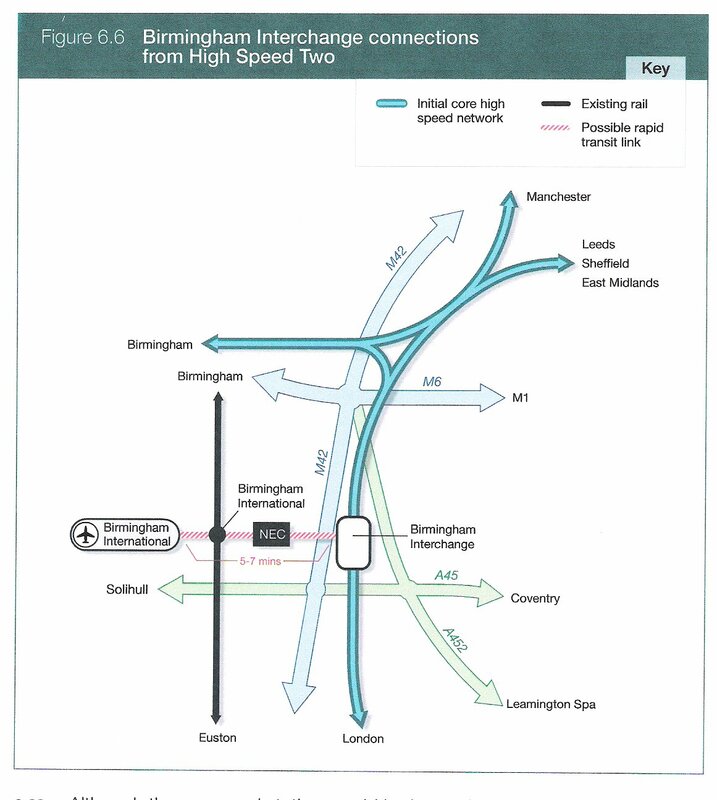 The Chiltern High Speed route to Birmingham - which we call the CHSL - is the prefered route to the West Midlands. About that we have no objections but we do have strong objections to the termini and stoppings places en route. We also insist that our alternative of a high speed route to Manchester and Leeds by using the MML corridor is much better and very probably less expensive. The White Paper itself is very dismissive of achievements already made which sounds like a self justifying argument for the high speed line. "Further major upgrades to the existing network would be highly expensive, problematic and disruptive. 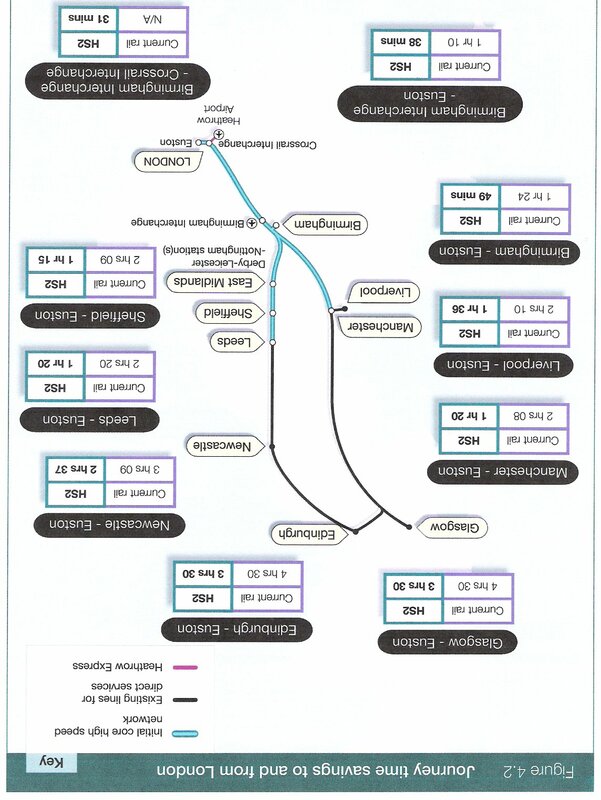 The West Coast Route Modernisation project cost GBP8.9 billion and took almost a decade. It delivered fewer benefits than originally envisaged and caused serious disruption to travellers and to business at a significant economic and social price in addition to the cost of the project itself." This is downright false when the line speed is limited to 125mph even though it is technically possible for speeds of up to 140mph(224kph) on certain stetches of the WCML which Virgin trains refuses to identify (we suspect it is along the newly four-tracked Trent Valley Line and shorter sections elsewhere). To quote the engineers "The route has brought numerous benefits to passengers with increased train services and reduced journey times". At present with that speed limit the fastest time Euston-Glasgow is 4hrs.8mins. - a very respectable time. North West England is also much better served with most services non-stop from Warrington to Euston at 1hr.44mins. These are much improved times on the previous timetable. We contend that with the points we laid down in FAST-TRAX - CONCLUSIONS (8th March points 1,2,3,4)the criterion are clear enough to satisfy the demand for high speed services in a satisfactory manner without digging up great swathes of the countryside. We have to emphasise that using the same corridor does not necessarily mean running tracks side by side. However, where it is possible to run tracks side by side or next to a motorway then the environmental impact is much less and thus should be made a major consideration. On the route to Birmingham (CHSL) it has been designed for trains to run at 400kph (250mph) which is faster than any other line anywhere with the aim of being in a position of taking advantage of future improvements in technology. That is laudable but only really in a large country with great empty spaces - which is certainly not the case in Great Britain. A ninety degree turning circle, without slowing, means between 7.2 and 8 kms. to change direction. 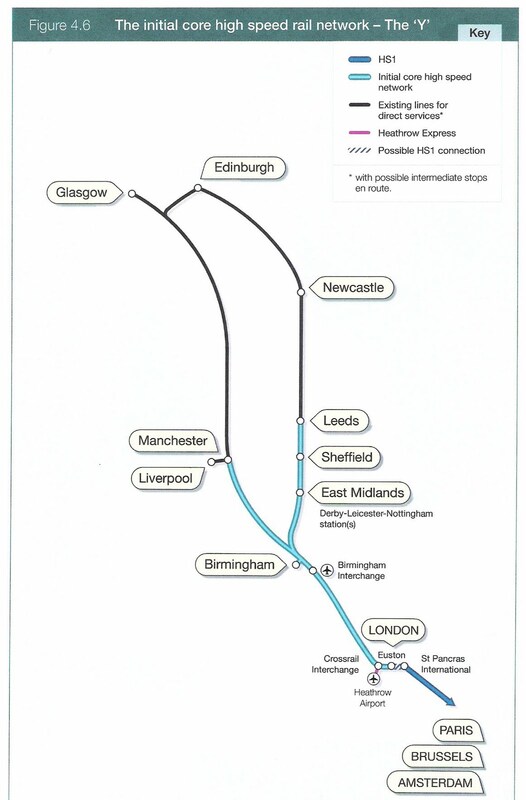 This is ludicrous - such that the line from London needs a new station called Birmingham Interchange some distance from Birmingham International Airport station to which it is meant to connect. This is ridiculous duplication and waste - the proposed station is not even on the west side of the M42. Approaching the West Midlands conurbation it is logical to reduce speed to stop at such a station so a lower line speed limit can be applied thus aiding the flexibility of the track layout to permit its entry into Birmingham International Airport station. The trains could then continue up to Lichfield as envisagedThe paper gives us to understand that trains into Birmingham and those onwards to places further north would all stop at the Interchange thus making this proposal realistic. Of course what has been ignored is (a)the noise factor - the higher the speed the greater the noise, and (b) the power factor - the faster the speed the greater the need for electrical power. These points we looked at in our first blog FAST TRAX (13-2-10). The points to be looked at in greater detail are concerning the two proposed termini at Euston and Birmingham Fazeley Street, and the intermediate station at Old Oak Common. These we will look at in the next blog. Also what should not be ignored is the possible connection to HSR1. Here again the thinking is limited with the fixation of funnelling more and more traffic through London which would only lead to the creation of bottlenecks. We contend that our proposal for a southern high speed line alternative - Fast Trax 2 (24-2-10) running from Reading to Ashford through Heathrow and Gatwick is a much more beneficial solution offers more alternatives and satisfies the demand for long distance services from the airports. This would also override any demand for a Heathrow hub which, at present is only fraught with shallow thinking and awkward solutions. To sum up the White Paper should turn Green and just lead to more discussion with more interesting and less entrenched positions to be considered. This is a major infrastructure project and cannot be permitted to be pushed through to satisfy the whims and ambitions of politicians (whatever colour) and engineers.